Beautiful language and stunning imagery stand in stark contrast to some of the worst horrors humanity has to offer. 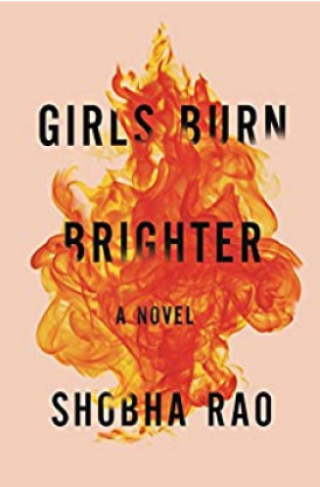 Shobha Rao’s Girls Burn Brighter is a challenging debut novel that makes you wonder which is more powerful, the strength of the feminine or the cruelty of the masculine. With a strong message about the oppression and resilience of women, and the strength found in a soul mate of any kind, this story, while heavy handed in its delivery, is a strong voice for the promotion of the strength of women united. Girls Burn Brighter is a novel for the reader who enjoys feeling emotions. Anger, sympathy, outrage, incredulity seep in from every corner as Poornima and Savitha navigate a world that does not care about them. But underneath is all is a current of hope. Because it is only each woman’s love for the other, and the certainty and desperation that they will one day reunite, that keeps each of them going. And for each woman that meas something different. In the end, if one might call it that, we are left to believe that there is such a thing as divine intervention, and that, for better or for worse, sometimes the universe looks the other way. I recommend this book to fans of Lisa See’s Snow Flower and the Secret Fan, perhaps to readers who enjoyed The Kite Runner by Khaled Hosseini, and to anyone who enjoys a book that makes them feel strong and deep emotions. This sounds interesting! I’ll add it to my reading list for my holiday this year.